The Epson 125 Combo-Pack Standard Capacity Ink Cartridges prints digital photos that look and feel like traditional color lab prints. This quick-dry, ultra-fine ink provides vivid high-image quality output with minimum dot gain. When the most vivid, brilliant colors and true deep blacks are critical to a photograph or proof, Epson inks are a logical choice. Epson photographic dye delivers a print with unparalleled color, density, and clarity. This ink is a favorite among commercial photographers, pre-press proofing, and design professionals. 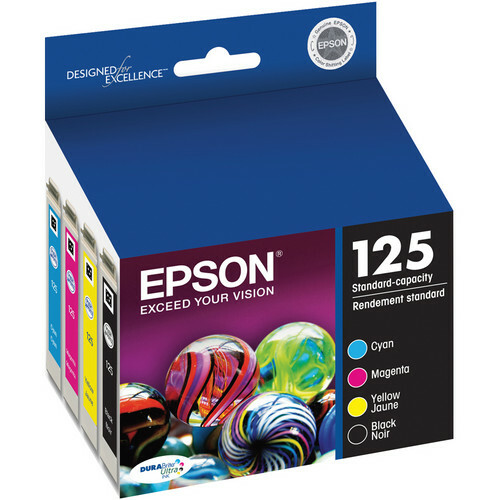 Box Dimensions (LxWxH) 4.9 x 4.5 x 2.75"
T125120-BCS 125 Combo-Pack Standard Capacity Ink Cartridges (Cyan, Magenta, Black, Yellow) is rated 4.6 out of 5 by 16. Rated 5 out of 5 by Anonymous from Epson Inks I wish the cartridges had more ink to last longer. They are expensive to replace. I also use Ink Cartridges for the Epson Stylus Photo R2400. Recently the office supply store, where I was able to buy locally, discontinued selling these cartridges. I am satisfied with the quality of the Epson ink products. Rated 5 out of 5 by Anonymous from Epson 125 Combo-Pack Ink Cartridge The combo-pack is extremely useful for the Epson 125 printer series. This economically priced bundle contains the four colors needed to run your printer optimally and allows you to keep cartridges in stock to be used as needed for printing purposes ranging from everyday copies to high quality photographs. Rated 4 out of 5 by WRon from Good Ink As is the case with most inks for printers, the printer maker essentially gives you the printer for free (not really, of course)and then makes money on selling the inks. Be that as it may, the ink cartridges work well as they should. Wish they had a little more capacity. Rated 4 out of 5 by Koot from Rate ink, really? ok It's ink, the printer won't work without it. The red was red, the blue was blue. Worked great. Two packs of 4 cost almost as much as the printer did; such greed, shades of Wm. Gillette. It's not B&H's fault, they did a fine job, shipping quick. Rated 5 out of 5 by Anonymous from Printer ink-easiest and cheapest way! The service was fast and efficient. I have been checking all over and this is the easiest and cheapest to keep my home ink supply stocked. I hate running out during a project, so I like to stay ahead. Thank you for great service. Rated 4 out of 5 by Adam of GLM from Now printing! My printer refused to print until I changed the cartridge. I did. Now it prints! Wonderful. Wish it would last a little longer is the only room for improvement. Rated 5 out of 5 by Dorothy from Excellent printing cartridges I use the epson printer mostly for color copies of pictures and a few documents. The colors are good, and documents print cleanly.